Word of the Year: Popular words this past year from countries around the world. Words of the Year from Around the World. Can You Say Gubbploga? A version of this post originally appeared on The Week. You’ve heard about selfie, science, and because. But we aren’t the only ones who like to try to capture the spirit of the year in a word. Here are some Words of the Year chosen by 13 other countries. The Language Council in Norway chose sakte-tv (slow-TV), reflecting the popularity of shows like “National Wood Fire Night,” a four-hour discussion of firewood followed by an eight-hour broadcast of a crackling fire. Some of the good competitors were rekkeviddeangst (range anxiety)—the fear that the battery of your electric car will run out before you can get to a charging station—and revelyd (fox sound) because, of course, Ylvis. The Swedish Language Council takes an egalitarian, Swedish approach to the word of the year, releasing a list of the year’s new Swedish words without declaring a winner. I like the sound of gubbploga (old man plowing), which refers to criticism of snow plowing priorities that put male-dominated workplace routes over bus and bike lanes and schools. Another good one was nagelprotest (nail protest) for the practice of painting your nails in the name of a cause—for instance, getting a rainbow manicure as a statement against Russian anti-gay laws. A member of the Danish Language Council, along with the hosts of the “Language Laboratory” radio show, chose undskyld (sorry) as Word of the Year, making specific reference to the apology a politician had to make after his luxury travel expenses were revealed. It won out over some familiar choices like twerk, selfie, and lårhul (thigh gap), but also gastroseksuel (gastrosexual, for food lovers) and kønskrans (“gender wreath”), a proposed substitute for jomfruhinde (hymen, or “virgin barrier”). GroKo is short for Große Koalition (Grand Coalition), an agreement between the conservative and center-left political parties in the German parliament that was hammered out over a long period of negotiation. It suggests the word Kroko, meaning crocodile, which according to the Word of the Year judges at the Association for the German Language, captures a half-mocking attitude toward the whole negotiation process. It beat out big data, Protz-Bischof (bling bishop, referring to a scandal in which a bishop spent millions on new digs), and freund hört mit (friends are listening), a play on the Nazis’ wartime anti-spy slogan “feind hört mit” (enemies are listening), referring to revelations about NSA surveillance. 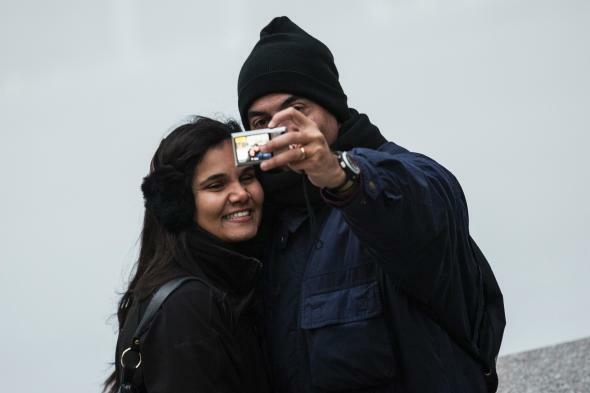 Selfie was the Dutch Word of the Year in the Netherlands, according to dictionary publisher Van Dale. Twerken won the Youth Language category, and scheefwerken (skewed work) won the Lifestyle category. It means work that’s below one’s training or experience level, something a lot of people have had to settle for in recent years. Winners in other categories included some good Dutch compounds like hooliganheffing (proposed hooligan tax on soccer clubs to pay to offset police workload during games) and participatiesamenleving (participatory society). Selfie also won for Belgium, even though it isn’t a very Flemish word. Nor is swag, the winner in the Youth Language category, or duckface, the winner in Lifestyle. In Spain, the newspaper El Mundo named an importation from South America, escrache, the Word of the Year. It refers to a protest against corruption where people gather to denounce a politician or public figure outside their home or workplace. It comes from the Argentinian verb escrachar (publicly expose) and was first used during investigation of the crimes of the dictatorship there. It was used in Spain this year to refer to protests having to do with the mortgage crisis. The economic crisis was reflected in many of the other candidates, such as copago (copayment for access to public health care), quita (“remove” in the context of debt forgiveness), and austericidio (austericide, or suicide by austerity). It wasn’t all doom and gloom. Selfie made the list there too, but in Spanish it’s autofoto. A poll by publisher Porto Editora selected bombeiro (firefighter) as the Word of the Year. It honors the firefighters who had to battle the raging wildfires that consumed forests in southern Portugal over the summer. Plénior was selected at the XYZ Festival of New Words in Le Havre. It refers to a senior who’s living life to the fullest, a blend of pleine (full) and senior. The way it puts an enthusiastic, positive spin on things doesn’t seem very French, but good for you, pléniors! Enjoy yourselves! In China, a group of government organizations choose the Character of the Year. This year’s choice was fáng 房, which occurs in words having to do with housing. Appropriate for a year in which a housing crisis and a real estate bubble factored prominently. In the poll conducted by Lianhe Zaobao, the Chinese language newspaper in Singapore, the word mái 霾, meaning haze, won with 130,000 votes, beating out words like tān 贪 (greed) andwǎng 网 (internet). Some of the highest pollution levels ever recorded occurred there this year. When there’s more haze around you than either greed or internet, you know you’re in trouble. The winner of a poll by the Taiwanese newspaper United Daily News was jiǎ 假 (fake), inspired by frequent news about fake products and food safety scandals.